The Ninth Rain is the first novel in a new fantasy series by Jen Williams. It's also the first novel by Jen Williams I have read, so I didn't quite know what to expect. The description and blurbs by other authors sounded a lot more promising than the cover looks (I pretty much hate the cover). Ebora is a fading civilization. Ever since their tree god Ysagril died, these long-lived elven people have been in decline, their main source of longevity being its sap. Soon after Ysagril's demise, they discovered that drinking the blood of humans could reinvigorate them. After some decades and centuries of gory vampiric excess, they find that drinking the blood of humans is, ultimately, poisonous and fatal. Oops. Fell Noon, meanwhile, is kept imprisoned in the Winnowry with all the other fell witches. Hated, feared, oppressed and exploited by priests and nuns, the fell witches live miserable lives. Their magical winnowfire is unlike any other, and the Winnowry uses it to produce drugs and products that no one else can manufacture (it's handy, having a monopoly on a manufacturing process). At the same time, the fell witches are seen as the root of all evil. It's slavery and misogyny and exploitation at its ugliest, but Fell Noon does not resist, because she has her guilty past... and because punishments for resistance are severe. It's Vintage, a woman from a rich landowning wine-producing family, whose projects will ultimately lead to their paths crossing. Vintage's passion is (scientific) research. Almost as a side effect, this involves exploration: her research is focused on remnants and artefacts from the previous Eight Rains, which are spread all over the world. It took me a while to get into The Ninth Rain. This may be because I was reading it alongside other books (which I was under some time pressure to finish), but I also suspect that starting with Tormalin and a fairly extensive set of pre-plot scenes may have had a slowing effect on some readers. However, I did get properly hooked (by the time the story reached the mushroom forest), and by the end I struggled to put down the (whopper of a) book at all. It's gripping stuff once you get into it. The world of The Ninth Rain is not too different from other fantastical worlds (although I must admit, vampire elves are new to me, and such a logical thing I am surprised that no one else has thought of this until now). What makes a big difference is the Rains. They give a much more credible context to the returning evil, which contrasts with the out-of-nowhere corruption that spreads in classics like Lord of the Rings. The Rains come from somewhere - it just happens to be off-world. Just like The Rains, other aspects which seem like staples of the genre are cleverly explained within the novel, which reinvigorates them and lifts the book above using cliches. The heart and soul of a novel of great length is its characters and the chemistry between them. Sure, the skirmishes and fights are exciting, the chasing pursuit tense, the world intriguing and the sense of building tension builds up pleasantly like a slowly accelerating river on its way to the falls, but The Ninth Rain is above all a novel about three interesting people. Vintage is the glue that holds everything together, immensely likeable, yet quite tough when she needs to be, and not flawless either - she has her hypocritical sides. Noon, the poor thing, seems in urgent need of a hug. Tor, meanwhile, is a bit too pompous for his own good. Unsurprisingly, for a novel written in the 20teens, the characters are of different skin colours and sexual orientations, but the diversity is utopian in its equality: people on this world have their prejudices based on physiological differences (bloodsucking, fire-starting, life-draining) rather than cosmetic ones (skin colour and sexual preferences). It's a bit like Star Trek in that regard. The Ninth Rain is a novel where pretty much everyone tries to get along, or has really really strong motivation for adversarial actions. It is part of the softening trend in genre fiction. After hyper-gritty and ever more grimdark excesses, there's an entire spate of novels that are written (often by women writers) with a kinder core. Think Long Way to a Small, Angry Planet, or the Natural History of Dragons series, or The Best of All Possible Worlds, or even The Collapsing Empire. All of these novels, to my mind, have something Whedonesque about their core groups of characters (Firefly's spirit lives on): the protagonists tend to form groups that are a bit family-like, only less dysfunctional. Expect bickering, a bit of banter, and plenty of fuzzy feelings. The Ninth Rain evoked similar reactions in me. Also, the novel is filled with adorably loyal giant bats. 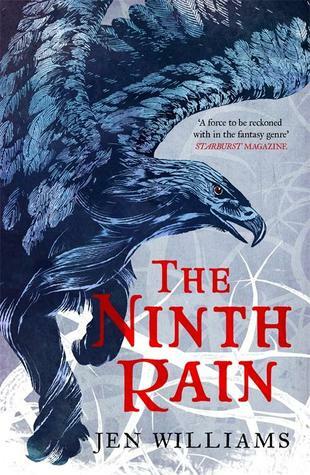 The Ninth Rain is a wonderful novel for fantasy readers. It's big, filled with ideas and fun. One of the early highlights of 2017: not to be missed. PS: On the topic of that cover: there is so much I dislike about it. The picture of a griffin? There is no important griffin in the book. The cover looks a bit like something I'd expect to see on a self-published novel or a small press novel. But most damningly of all: our heroes are a black woman, an olive-skinned woman and a vampire elf. I find myself wondering whether putting some fantastical creature (which makes no significant appearance in the story) is a symptom of a marketing department's fear of putting people who aren't white on the cover of a fantasy novel. Great review. I saw somewhere (GoodReads or a blog, can't remember) this cover was one of the favorites. I honestly didn't find it any good. Now I understand it isn't even relevant. Haven't read the book yet. Planning to, soon. I think the cover might partially have been an attempt to make it look like it could fit in with the other trilogy by the same author, but yeah... not a huge fan. Need to get to this one.